How do I add new users to my site? Why don’t my hero images auto-rotate? Why can’t I use the password option on a WordPress page or post? Why don’t I see the option to add “Additional CSS” in my theme Customizer? Why can’t I have FTP access to my site? Can I add my own code to a project? Can I change my site font from Verlag to something else? I was told my content would be better as a Custom Post Type, but we don’t have the budget for custom development. What can I do? Why does the UW Theme not have the same functionality as the wisc.edu site? I’m frustrated that my request hasn’t been adapted into the UW theme yet. How soon will that happen? If I want to contribute to the theme, how would I do that? I have little technical knowledge. I don’t like the design of the theme. How can I change it? How do I structure my site content? What is the difference between “Draft” and “Published” pages and posts? When should I use posts versus pages? How do I structure my (really complicated) categories and tags for posts? Why can’t I work on my site in Dev in order to test changes to my content? How can I show my team changes that I’ve made to the live site before they go live? Why can’t I add plugins to my site? Who do I ask to have a plugin added to my site? How can I use MailChimp plugin with my site? Why isn’t my Gravity Forms form sending emails? Why won’t my file upload to the Media Library? Why is the wrong info showing in search results for my page? Adding users to your site is a simple two-step process that involves them first signing into WiscWeb and then you adding their NetID to the project. Full instructions for adding a new user to your WiscWeb site can be found in our KnowledgeBase. The most important step in this process is to have your user sign into WiscWeb before you begin the process of adding them. This will capture their credentials in the system and will allow you to find them when you want to add them as a user. It is recommended that they use a private or incognito window in their browser to complete this step as it will produce the best results. Issues with logging in to your site are nearly always a result of attempting to login from off campus without being connected to the campus network. In order to use the WiscWeb tool from off campus, you must be signed in to the campus network using the Palo Alto “Global Protect” VPN client with your personal NetID credentials. If you are either A.) on campus or B.) off campus and already connected through VPN, the issue may require more troubleshooting. In these cases, please contact us at our cms-support@doit.wisc.edu to let us know about your login issues. Please include your website URL, your NetID, and any error messages that you encounter when you try to login. Image carousels aren’t accessible for users navigating the site with a screen reader. Extensive research has shown carousels are actually not nearly as engaging for users as we assumed. What is the difference between "Draft" and "Published" pages and posts? Pages and posts that are saved in Draft mode are assumed to be “in development” and therefore, will not show on the site. This is not a problem when the page or post has never been published but if they have, it will be removed from the website entirely until you re-publish. We recommend that you do not ever set your pages or posts to Draft if you do not wish for them to be removed from the site until publish. Instead, create a copy and do your edits there. Then, when you are ready to publish, put up the copy version and take down the other OR paste the contents of the copied page into your existing page and publish right away. WordPress offers a rudimentary password protection option for pages and posts. This can be set with an admin-designated password in the Publishing region of the page (under Visibility). Typically, this is a pretty simple way for site administrators to lock down a specific page or post without having to download a page-lock plugin (or lock down the entire site with a Manifest Group). However, this feature is currently not functional for users of WiscWeb as it conflicts with the campus Shibboleth technology. WordPress is different from a lot of other content management systems because it started as a blogging tool and then grew into a tool that was used world-wide for the building and maintenance of regular websites. As a blogging tool, it was assumed that users were mostly generating content via posts (like news articles) and that’s the basis for how this tool was structured. Therefore, everything in WordPress is technically a post – even pages! Confused yet? The biggest thing to remember is that you should use “Posts” (in the left nav options) when you are focusing on news or blog content that you’d like to feed into a post list. This is usually the only way that true Posts are used in the UW Theme. You should use “Pages” to build out the content that will go in the navigation of your site. To reiterate: Pages are the main content holders while Posts are just for articles. What is the difference between Pages and Posts in WordPress? How do I launch my new WiscWeb site? We’re happy to report that the process for launching your new WiscWeb site is very easy! We ask that you first review our Preparing for Launch page. When you are finished, please fill out our Launch Request Form at the bottom of that page. The wisc.edu site was updated with new campus branding in January of 2016. Mid-way through 2016, other campus sites started requesting this same template (look and feel) and University Marketing decided to build out the UW Theme Lite theme for use by WordPress users on campus. The biggest thing to note from this timeline is that the wisc.edu site was not actually built with the UW Theme. Instead, the UW Theme was designed to look like the styles that were introduced on the wisc.edu site back in 2016. Therefore, just because something appears on the wisc.edu site, does not mean it is automatically added as an option in your WiscWeb site via the UW Theme. The answer to this is equally complicated and really depends on the functionality. The UW Theme developers have not finished building it yet. This does not happen often but the UW Theme developers do try to incorporate wisc.edu functionality when it makes sense to do so and it will benefit the masses. This functionality is not easily or adequately implemented by the average campus web editor. Some of the functionality on the wisc.edu site is just so specific that campus editors would require much more advanced web development or design skills in order to properly implement them. The UW Theme is meant to be easily digested by a large portion of campus editors from all different skill levels so adding this type of functionality would mean more support and maintenance than what can feasibly be provided. The functionality is meant for a specific purpose that is unique to the kinds of marketing and promotional needs that the wisc.edu site requires. The wisc.edu site, unlike most campus websites, is both an informational page as well as a marketing tool. Therefore, the kinds of functionality they need on their site differs greatly from what the average campus website needs. If you are interested in certain features of the wisc.edu page because you think it will fulfill a specific need that you have for displaying information on your site, we want to hear about it. This will allow us to gauge how many users on campus have the same need and we can deliver something that will be targeted for campus informational sites. Please fill out our Feature Request Form and let us know what kind of needs you are trying to accommodate. Why can't I have FTP access to my site? There are several reasons for this. WiscWeb is a multisite instance of WordPress. As such, providing you FTP access would grant you access to all WiscWeb sites – not just your own. We really do not want users to have the ability to change projects that are not their own and therefore, FTP access is not allowed. We also have strict version control processes in place to maintain the stability of the multisite for all customers. Allowing folks access to make changes via FTP could jeopardize this stability and result in site or entire service outages. Please note that Amazon Web Services (AWS) does not facilitate FTP access. Why can't I add plugins to my site? WiscWeb is a controlled and supported WordPress multisite environment. All plugins go through a vetting process prior to addition to the multisite to ensure that they will not jeopardize the stability of the service. This vetting process can be reviewed on our Plugin Review Process page. Once plugins are added, the WiscWeb team supports them. This requires regular testing of each plugin anytime there are updates to the plugin itself, the UW Theme, or WordPress. It also involves a significant amount of testing on individual sites to ensure that customizations, styles, and functionality are rendering correctly after plugins are activated or updated. We vet and limit the plugins so that we can continue to maintain this level of security and service integrity. While we cannot allow you to add your own plugins to your site, we do offer several plugins under our service. Our full list of available plugins can be found here: https://wiscweb.wisc.edu/plugins/. Why don't I see the option to add "Additional CSS" in my theme Customizer? Under the WiscWeb service, the “Additional CSS” field is not available to admins and editors of the site. We require that all CSS updates are added directly to your project’s child theme. This is to prevent new UW Theme updates from potentially overwriting the changes that have already been made to your site styles. Please note: any custom CSS or logo changed to the UW Theme in WiscWeb must be approved by UW Marketing. We will facilitate this process for you. If you would like to request customizations to your site, please contact cms-support@doit.wisc.edu. How can I show my team changes that I've made to the live site before they go live? Prior to launching your new website, you can publish and view all changes at your sitename.wiscweb.wisc.edu URL. This is a shareable link and the site’s contents will only be visible to those who have this URL. You could build out the pages and save them in Draft and then login to show them to a group. Users who did not have access to the site would not be able to preview these pages so you would not be able to send a link to a page that is in Draft. However, you could show them on your own computer. You could publish the pages but not link them from anywhere on the live site. You would access them by going directly to the URL. If there is ever a time when you aren’t sure the best way to present information on your site, we recommend attending one of our Open Labs to speak directly with a member of our team. They can meet with you to learn more about the issue you are experiencing and can offer suggestions based on your unique case. More information about our Open Labs, including a full schedule of upcoming sessions, can be found on our Open Labs page. At this time all customizations to sites in WiscWeb must be done by a WiscWeb developer, in order to ensure the stability of the entire multisite. There is a charge for customizations because this type of work is not covered by the campus funding. If you are interested in meeting with a developer to discuss customizations to your child theme in WiscWeb, please email us at cms-support@doit.wisc.edu so that we can setup a time. We will likely want to sit down with you at an Open Lab but will need to know which one you will be attending (Open Lab schedule). The version of your site that sits in the “Dev” environment is strictly for our testing purposes (plugins, WordPress, and plugin updates), and is not meant for content creation before releasing it to a published site. We do not offer a sandbox area for customers. This is to save overall costs for the campus. I see that site X has a particular functionality. Why doesn't mine? The customizations that you see on other sites are customizations that were paid for by the customer. This payment includes the ongoing maintenance and support of those customizations. There are some customizations that you see that may be related to plugins that are available but are not activated for every site (i.e. publications). All plugins that are available to Wiscweb sites are listed on the Plugins page (under Support). If you see functionality on another site that you like, check the plugins page to see if it is something that can be added to your site. Additionally, we receive a lot of questions about why their site doesn’t have the same functionality as the main wisc.edu site. For more insight into why that is, please refer to our other FAQ, Why does the UW Theme not have the same functionality as the wisc.edu site? How can I use the MailChimp plugin with my site? MailChimp is currently not an approved plugin under the WiscWeb service. If you would like to request a plugin review, please complete and submit our Plugin Request Form. Would the requested functionality benefit the majority of campus? Does the benefit to campus justify the cost to create the functionality? If it meets these requirements, then resources can be allocated to the updates, testing and support. If you have a particular request that you have made, and you haven’t received an update, please contact us at cms-support@doit.wisc.edu to ask for a status. In WiscWeb, all requests for changing the UW Theme must first be approved by UW Marketing. You can submit your request using our Header Redesign and Color Changes Form. Once your request has been approved, please email cms-support@doit.wisc.edu and the WiscWeb team will set up a time to discuss the desired changes with you. Please note that there will be a small fee for this customization. There is information on how to contribute to the UW Theme located on the UW Theme About Page. Please note that if you have little technical knowledge, this process may prove challenging. If there is something you have questions about, please make some time to attend one of our Open Lab sessions. A discussion of your needs will allow us to best assist you so be prepared to answer questions about what you are looking to do. In WiscWeb, all requests for changing the UW Theme must first be approved by UW Marketing. You can submit your request using our Header Redesign and Color Changes Form. Once your request has been approved, please email cms-support@doit.wisc.edu and the WiscWeb team will set up a time to discuss the desired changes with you. Please note that we have an hourly rate that we charge for this work. We have the ability to do some initial consultation about the structure and layout of your site’s contents. DoIT also offers a full UX and Content Strategy evaluation service (fee based) for more complex requirements. If you are interested in these services, please contact cms-support@doit.wisc.edu. If you do not have money for custom development, you will need to rethink your requirements for the content. Please come to one of our Open Lab sessions and work with our team to come up with a different option. We can help look for different ways within the UW Theme to display the content. Why Isn't My Gravity Forms Form Sending Emails? In June of 2018, we moved our service to Amazon Web Services (AWS). As a result, an update was made that requires a change in the configuration of your form notification settings. 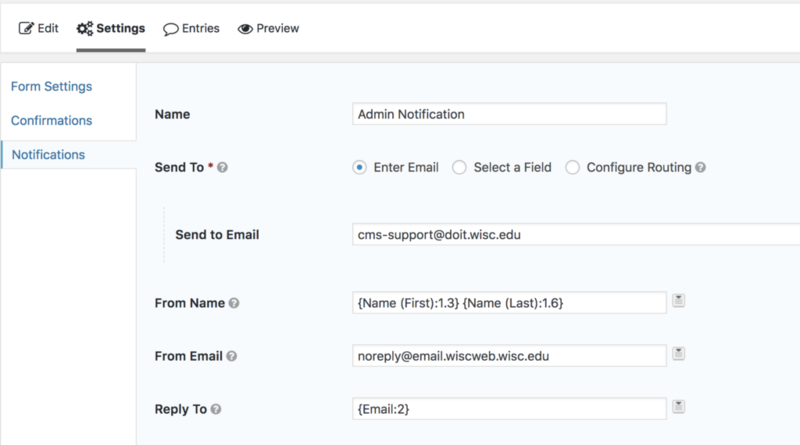 You must now enter the following email address in the “From Email” field of the Notification Settings for every form on your site: noreply@email.wiscweb.wisc.edu. If you do not have this set, your form will not send an email to the intended recipient. If you have already updated the From Email with the designated email address and your form is still not sending as expected, please reach out to us at cms-support@doit.wisc.edu. Include your website URL, NetID, and form name. Why Won't My File Load to the Media Library? If you are loading an image in the form of a JPG, try re-saving it as a PNG. PNG files tend to be smaller in file size. Photos could also get compressed to reduce the image file size. For movie files like .mov’s and .mp4’s, consider loading the file to a tool like YouTube or Kaltura for hosting the content. You can then use <iframe> code to embed your video within the text area of a page. For other files like .doc’s and .pdf’s, you can use UW Madison’s Box tool. Load them to a folder and then just link to them from the text in the page. Please note that we recommend requesting a new Box project directory for your team if one does not already exist. That way, the folder doesn’t have to be owned by an individual person. Why is the Wrong Information Appearing in Search Results for My Page? Every time you build a page on your site and publish it, an excerpt will automatically get generated if you don’t manually set one. The content of this excerpt is what appears as the page description in search results for tools like Google and Yahoo!. If not designated by you, WordPress will take the first sentence or so of your page and assign it as the excerpt. Most times, this text makes sense for the description of the page. However, in some cases, this text is inaccurate because it is out of date or was just placeholder text when the page was built. In those cases, your page excerpts may need to be updated. If you see text in search results for your pages that is not desirable, please follow our steps for updating the Excerpt field of the page in the UW Theme.